We were at the top of one of the many Atlas mountain ranges when we found ourselves speechless. Even in Morocco, where tourism plays a big part in the economy we were able to find ourselves in awe of the seemingly infinite space around us. 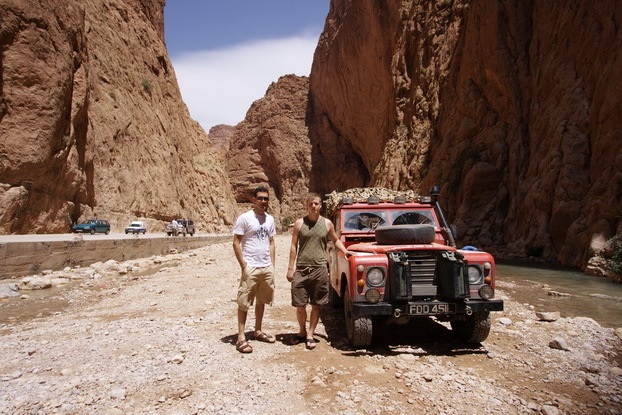 The Moroccan Road Trip 2010 was another truly breathtaking adventure. It exceeded our expectations of adventure, just as we entered Morocco thinking our trip would be somewhat tamer than previous adventures we found ourselves opening the door to a series of crazy events we could never have imagined. Almost every day there was some sort of incident which added to the adventure. 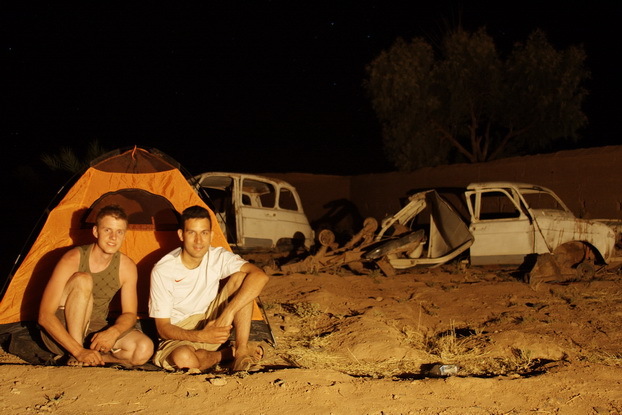 From getting stuck on a beach with the tide coming in, becoming buried by a lake full of flamingo poo to getting lost at the top of the High Atlas and navigating sand dunes in the dark with a snapped car chassis. These are just some of the major events we had on our rally. 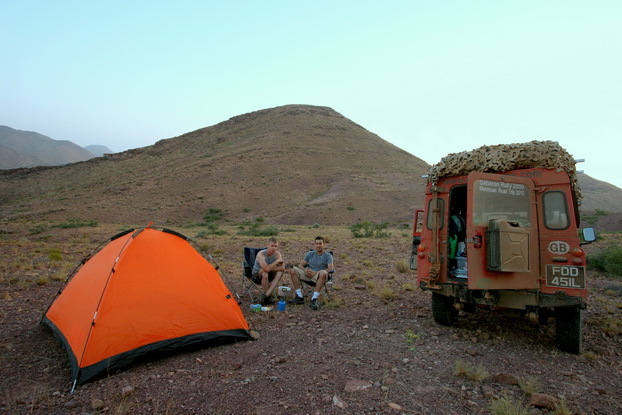 So we are back now, having finished the Moroccan Road Trip 2010 on Saturday 10th July. We arrived a day earlier than expected after completing a drive through Europe that can only be described as a mad European rally run. Driving almost nonstop from Wednesday at 6am through to the Saturday afternoon. The photos from our rally have now been uploaded and are available on the photos page. The video is in the process of being prepared and there will be some additional updates to the site in the near future. We have so many people to thank for their generosity and help. We are very very grateful to all of you who have donated to the Mercy Corps, we were genuinely surprised by the generosity of those around us and by the enthusiasm people had for our trip. We also had some pretty difficult moments in Morocco where we were in need of help and the Moroccan people we met were nothing but genuine, hospitable and kind. We were really touched by the actions of some of the Moroccan people we had the pleasure of meeting. Many people in England also helped us with advice and tips for our trip, both in Morocco and through Europe. We hope you enjoyed some of the SMS blog commentary we posted while on the trip. Thanks to Chris and Kai at PebbleTrack who once again provided us with an excellent solution which enabled everyone to follow our progress on our website via the GPS tracking capability that they added to our vehicle. We have a vast amount of GPS data that is stored at PebbleTrack that will enable us to rebuild our exact route on the rally. We plan to post up the detailed route with some further information in the near future. If you haven't yet had an opportunity to make a donation to the Mercy Corps, we hope our completed adventure will encourage you to do so. We drove over 5,200 miles on the rally in 17 days and visited almost all corners of Morocco in the process. We're very close to reaching 100% of our fund raising target but hope we will continue to exceed this as we believe the Mercy Corps is one of those charities that can make a difference in many countries around the world. We have launched at 5.30am on Thursday 24th June 2010. You can follow our progress on this website using the map tracking above and the SMS blog feed that we'll be updating on a daily basis. Thanks to all of you who have supported us and the Mercy Corps. With 10 days to go till the launch of our rally, we're pleased to say that the car is now ready for the rally. You can read more about that on our blog. We've also been stocking up our food and drinks for the rally and probably only need 1 more trip to the shops before we hit the road. Our tracking facility has now been added to this website. This site will be the main tracking site as it will also update automatically with any updates we have when we are on the road through our SMS blog on the right side of the page. It has been a while since we've updated our main website, that has been mainly due to issues resulting us in delaying the launch date of the rally. Initially we were due to set off in the first week in June, well we're now confirmed to depart on the 24th June 2010. There has been a slight change of plan, we're now using our 1963 Land Rover instead of the 1989 Suzuki SJ413. We were running out of time to repair our Suzuki and the 24th of June was our last departure opportunity for 2010. Our vehicle tracking is now up and running on our main blog site. The tracking facility will be made available on this website soon. This will give you the ability to track our progress as we head for Morocco and drive through the Sahara. The challenge this time is very different to our previous challenges. We have less than 3 weeks to complete what was originally going to be around 4000 miles and is now likely to be between 5000 and 6000 miles. We now also have the summer Sahara heat to deal with. This will certainly be our hottest rally and with average temperatures in some parts of the Sahara in excess of 40c (106F), it is certainly going to present us with some new challenges. Having discovered that we actually like having sand with our digestive biscuits and that the Sahara is full of splendid adventure, we have decided to visit it again. This time we'll be taking on the western Sahara in all its glory through the colourful Morocco. Our departure date is yet to be confirmed, but we expect the weather will be somewhat hotter than our previous visit to the Sahara in 2009. Is this another Rusty Rhinos Rally? It sure is, but since we anticipate our mileage will be in the region of 4000 miles (6400 kilometres for the imperially challenged) , we couldn't justify calling it a rally, so this the beginning of our Moroccan Road Trip 2010.